sorry the blog has been so quiet – work has been bonkers since the start of the year and everything is suffering as a result, not least creative time in the kitchen and quiet time to write about it. thankfully i have been able to find some time to take advantage of january’s seasonal fruit. much of the delights are focussed around citrus fruits and as well as forced rhubarb, which was combined with grapefruit to make one of my favourite “jams”, i have been using blood and seville oranges. the bitter seville oranges are generally used for marmalade and this was the slightly predictable choice i made. however i did manage to use a less than predictable ingredient combination – nigel slater’s seville orange, lemon and ginger was my recipe of choice. while i followed the recipe to the letter, i had a moment of confusion about whether or not i should be using or discarding the pith. advice online was mixed and so i used a combination of both. the result is tart enough and the ginger adds a subtle exotic hint of flavour. using a small sharp knife score the skin of each orange and lemon deeply into four from top to bottom. remove the peel, it should come away easily in four pieces, then slice into thin strips*. 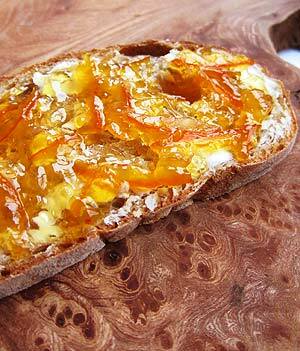 my preference is for pieces no thicker than a matchstick, but the texture of marmalade is a very personal thing. the next day, tip into a large stainless-steel pan and bring to the boil. lower the heat, add the ginger, peeled and cut into shreds, then, keeping the liquid at a jolly simmer leave to cook for about 50-60 minutes until the peel is translucent. remove the bag of pips and pulp and leave until it is cool enough to handle. add the sugar to the juice and bring to the boil, squeeze all the juice from the muslin bag into the pan. as the liquid boils, scrape every bit of froth that appears on the surface. this is crucial for a clear finish. boil hard for 15 minutes then start testing for set. remove a tablespoon of the jam, put it on a cold plate or saucer and put it in the fridge for a few minutes. if a thick skin forms on the surface it is ready. if not, then keep boiling and retest. ladle into sterilised jars and label. * this was where i got confused about whether to add the pith or not. the method described for removing the peel didn’t work at all on my lemons so i just used a vegetable peeler and avoided the pith; i then had varying success with the oranges so used a 50:50 mix of just peel and peel with pith.